The Park Crossing Thunderbirds and the Lee-Montgomery Generals will play in the Youth-In-Action Kickoff Classic at Alabama State Friday night. Both teams had successful seasons in 2017 and look to make a deep playoff run this year. Park Crossing comes off a 10-2 season and going 1-1 in the playoff last season. Angelo Wheeler takes over the 2018 team and are expecting big things from the Thunderbirds. "We are taking this one game at a time," said T-Bird Head coach Wheeler. "Our ultimate goal is to win a state championship and they (Lee-MGM) are the first team up. Were just putting our focus on Lee this week. This is an emotional game and a physical game playing a team from our city. A lot of these guys grew up with each other so we need to keep our emotions in check once we hit the field." The Thunderbirds lost a couple key players from last year. Cam Taylor is at Nebraska and Tank Jenkins is at Texas A&M but the show must go on. Up next at quarterback is lefty Trevor Robinson. The junior QB Robinson played a little last season and looks to take over the reigns. "Were comfortable with Trevor," added Wheeler. "He is more of a game manager and very athletic quarterback. Our offensive coaches have done a great job with the offense so I think we will be just as productive this season as in the past." At wide receiver, Tremaine Osborne has a chance to be a good one. "Tremaine has flown under the radar," said Wheeler. 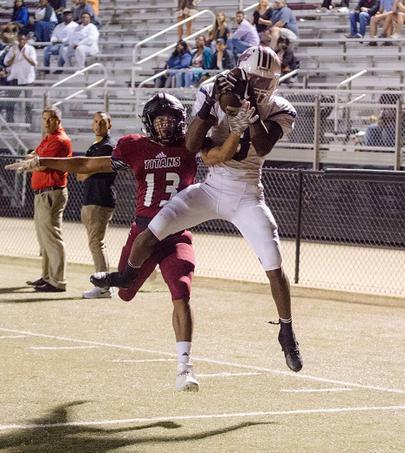 "I think he is one of the best receivers in the state of Alabama. He has developed so much more over the summer. I hope he can carry what he did in the summer to the fall and if he does he is going to have an outstanding year." One player that could go both ways and play some offense is Lamont Mitchell. The safety likes to go to the offensive coaches and get some playing time on that side of the ball. Also, LaQuez Cain (a Sidney Lanier transfer) will be a good fit for the offense who holds offers from Tennessee, Grambling and a few others. At running back, Justin Hendrix returns and bring in Davvion Taylor for the T-Birds run game. Ja'vion Broaden is the only senior on the offensive line which lost some good talent up front for the Thunberbirds. On defense, Park Crossing has a host of returning players and maybe one of the best secondaries in Class 6A. Cornerback Tacorey Turner (Troy commit) and Darius Hodges (Arkansas, ASU, Troy and Jacksonville St offers) lead the T-Birds defense. "Darius along with a lot of defensive starters return," added Wheeler. "The secondary, linebackers are back and two of the defensive lineman are back." Defensive back Turner returns and brings a lot of talent to the secondary. "When you have a 6-foot-3 corner that runs a 4.3 forty, there is a lot you can do with an athlete like him," said Wheeler. "We can put him on an island by himself and he can cover the best of the best receivers in the state. He can take care of one side of the field by himself with his frame and speed. Not to many quarterbacks are going to test him." Along with Turner is Ajmad Dailey, Steven Thomas and Mitchell in the secondary that brings a lot of experience in the game. This should be a ball hawking defense with that talent back for the Thunderbirds. Keys for Park Crossing in the game is the need to take care of the ball and the team that makes the least amount of mistakes can get the win according the Coach Wheeler. For Lee-Montgomery, the Generals are coming off an 7-4 record and 1-1 in the 7A playoffs last season. "We are all healthy and we had a good camp in the summer and fall," said Generals Head coach Tyrone Rogers. On offense, Tyrone Franklin is going to lead the Generals offense. "Tyrone can make all the throws," added Rogers. "He is a young kid but didn't get much of a chance to get on the field, but he can make all the throws. A tall kid that is about 6-foot 2 and needs to gain experience but works hard in practice. Everyday he makes a great play to get my attention so I'm interested to see how he performs Friday night. Were not going to force things like we might have done in the past but we just need to get creative with him." The Generals have two good running back in Tedarrian Murray and Claderius Pickett. Both look to be on the field at the same time this season to give the Generals a big running game they might need to start out with the inexperience quarterback. Pickett fought injuries last season but returns healthy for the 2018 season. This is going to me a much needed boast in the running game. At receiver, the Generals are inexperienced in that area but Coach Rogers is looking forward to their development. Kalique Dinkins and Jeffrey Smith have the most experience coming back from last season. On the offensive line, the Generals are probably the biggest in Coach Rogers tenure. Size isn't the problem but experience might be to start off the season. Will Derico, Keeundra Salter and Justin Chappelle have the most experience of the lineman. The Generals look to bring the other two starters up the speed as soon as they can. "Were going to need to run the football this year," added Rogers. "We going to have to throw some weight on their shoulders in Murray and Pickett to run the football especially early in the season." The defense is led by defensive end Phillip Hopkins. "Every year he just gets better and better," said Rogers. "He is a young man that worked hard and an awesome kid. He is sorta green on the football stuff but were looking for awesome stuff from him on the football field." Keys for the Lee-Montgomery from Coach Rogers is to keep our emotions in check after the fourth play. The team that makes the least mental errors is probably going to win the football game. We have to run the ball and tackle well on defense. Rogers says that they need to be steady for four quarters and not be to high or low.